Unlike you may believe, the giant squid is not the largest squid hunting the ocean deeps. There is another, much larger monster out there. It is the colossal squid, Mesonychoteuthis hamiltoni. Dwelling in the deep waters around Antarctica, this behemoth is truly amazing. It's eyes alone are over a foot across. Reaching over forty feet in length, it still isn't as long as the giant squid. However, it's body is longer and much thicker, giving it a more massive profile. Also, it has a wicked adaptation the giant squid lacks. 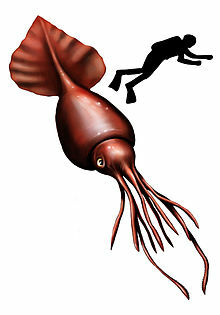 Whereas the giant squid only has suckers on it's tentacles, the colossal squid's thick arms are equipped with savage hooks to better snare it's prey. Pretty amazing, isn't it? I think the coolest thing about this real life sea monster is how many of them there are. Though almost never seen by humans, they are numerous enough to make up 77 percent of the Antarctic sperm whale's diet. It definitely makes you wonder. What other giant killers lurk out in those unexplored depths? Are there any estimates of how many of them are out there? There's not enough data on the colossal squid to guess at their population size, but the fact that they are a staple of a giant marine predator's diet tells me there has to be a pretty healthy amount.